Wes Anderson’s latest creation, Moonrise Kingdom is an incredibly sweet and simplistic film that is visually delicious. Set on the Island of New Penance off the New England coast in 1965, Suzy Bishop (Kara Hayward) is a troubled 12 year old who is causing her parents (Bill Murray and Frances McDormand) major headaches. She has been writing to another troubled 12 year old, Sam Shakusky (Jared Gilman) who is currently at scout camp and has had trouble making friends. The two decide to run away together and set up camp together in the island’s cove. They are being pursued by various members of the island’s community, all while the threat of a major storm is brewing off the coast. Moonrise Kingdom is an incredibly sweet film about first love and the innocence that goes along with it. The story plays out beautifully on screen and Wes Anderson and Roman Coppola’s Academy Award nomination for Best Writing, Screenplay Written Directly For The Screen is very well deserved. Like Anderson’s other films, he takes a simple concept and presents it in the most unique and original way possible. The visuals are just incredible. Anderson takes every location in every scene and uses it to its full potential. There is so much colour and little things which are usually dull and mundane, such as a bus stop, are suddenly made just so interesting to look at. The musical score also accompanies the story and the visuals perfectly. Jared Gilman and Kara Hayward are both superstars in the making. The two of them act beyond their years, particularly Hayward. They both create so much empathy with the audience and you are cheering for them to overcome all the obstacles and finally just be together….even though they are only 12 years old. It is great to see both Edward Norton as the scout master in a role which is different to what he normally plays and he is actually very likable. Bruce Willis isn’t a stranger to playing a policeman, but here he plays a very gentle character and, again, it would be great to see him play more roles like this as he is just so likable. 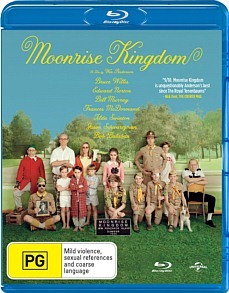 The blu-ray special features includes three featurettes which are A Look Inside Moonrise Kingdom, Welcome to the Island of New Penzance and Set Tour with Bill Murray. The Look Inside Moonrise Kingdom is a quick little featurette that skims over the surface of the film, but the other two features are great fun. Welcome to the Island of Penzance is where the narrator of the film, Bob Balaban looks at Bill Murray, Bruce Willis, Edward Norton and Wes Anderson and compares the actors to their characters. It is really very quirky and fun with a few behind the scenes laughs displayed in the most unique way. Bill Murray’s set tour is also fun and provides a few giggles.